All products shown include Free Shipping to lower 48 states. Hawaii, Alaska and Canadian shipping will incur additional charges. Please email us for a quote for shipping outside the lower 48 states. Include your full address and the items you will be ordering. Most shipping requests will be answered within 24 hours. All weights shown on TheBlueRooster.com are approximate shipping weights and may vary due to the nature of the product. This map is provided by FedEx Ground and shows the approximate ship time for your order. Most shipments leave our warehouse within 24 hours or 1 business day and 90 percent of orders received before 1 p.m. leave the same day. Day of pickup is not included in the map times and although there are a few exceptions, FedEx normally delivers within the indicated delivery time. You must contact us within 10 days of delivery to receive authorization for any items damaged during shipping. All products sold by The Blue Rooster Company are returnable for one year if in new condition. We do not accept returns of items that have been fired or damaged due to misuse. Email us or call Customer Service at 1-800-303-4312 for proper return instructions and a Return Authorization number. We reserve the right to refuse items that are sent back without a Return Authorization number on them. All outdoor fireplace returns must be shipped by FedEx Ground and be insured for the amount of purchase. Do not ship by UPS, USPS, DHL, or any other shipping service. Covers and small items can be shipped by your preferred method. 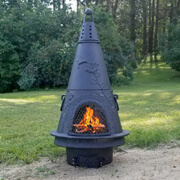 Outdoor fireplace returns shipped by any company except FedEx Ground may be refused and returned at the customer’s expense. 1. New - Package Unopened, Unused. Full refund less 10% re-stocking fee. 2. Like New - Package Opened. Item is undamaged, clean and resalable - 10% re-stocking fee. 3. Any unapproved returns will incur both original shipping cost along with a 20% re-stocking fee. Items with “Free Shipping or Shipping Included” in purchase price may have actual shipping charges deducted from refund. Please allow 10 business days to process returns and credit accounts. A copy of the credit transaction is sent via email. Return Authorization codes expire 30 days after they are issued, so please send your return immediately to the address provided after arrangements have been made with a Customer Service Representative. Customer Service Representatives are available Monday-Friday 9 am - 4 pm at 1-800-303-4312 for questions regarding your return. We are not liable for any claims in excess of the sale value of the item purchased, including any liability for products not being available for use. We will not be liable for lost profits, loss of business or other consequential, special, indirect or punitive damage, even if advised of the possibility of such damages, or for any claim by purchaser or third party except as expressly provided herein. Our sole liability for any claims, whether based in contract or tort, at law or in equity, for any loss or damages arising, resulting from, or connected with the products, and this agreement, shall be limited to the lesser of the actual amount of such lesser damages or the purchase price paid by customer or the products that are the subject of the claim. In plain English, we will never have to refund more than what you have paid for the item. Since 1997 our mission has been to design/manufacture the best chimineas available for people to enjoy their time together outdoors. Our commitment to customer service has earned us your trust and respect, as has our guarantee, which assures that we stand behind everything we sell. The Blue Rooster Company warrants chimineas (sold after 9-6-2018), to the owner, to be free of defect in material and workmanship for as long as you own the product. This warranty excludes spark grate, mouth screen assembly, and gas conversion assembly (if purchased with chiminea). The excluded items are under full replacement warranty by The Blue Rooster for a period of two (2) years from the date of purchase. **We do not warranty against rusting of any steel or iron parts of your chiminea. **We do not warranty the painted finish or any color change resulting from the use of your outdoor fireplace. The initial five (5) years warranty coverage of the chiminea structure is 100 percent. After five (5) years, The Blue Rooster will credit a percent of the original purchase price. The percent credit from The Blue Rooster Company applied to the current price of a replacement unit is as follows: 70 percent in year 6, 60 percent in year 7, 40 percent in year 8, 20 percent in year 9, 15 percent in years 10 through 19, 10 percent in years 20 and beyond. Customer will receive a percentage discount on the replacement chiminea only. No cash surrender value. Any discontinued items may be replaced by a similar item or one of similar value. Warranty determination will be made by Blue Rooster employees by photos or returned item or items. The Blue Rooster Company does not warranty parts damaged by electrolysis, overheating, oxidation, use of unauthorized fuels, or abuse. After a period of 2 years, if warranty requires replacement of any part or parts, The Blue Rooster Company will take responsibility for the actual cost of the replacement only. The customer is responsible for the transportation cost and labor. No other warranty is expressed or implied. The Blue Rooster Company is not responsible for any other indirect costs associated with replacement of the part. The Blue Rooster specifically disavows any other representation, warranty, or liability related to the condition or use of the product. If you have any questions or concerns regarding our warranty please contact us. We want your chiminea experience to be the best possible.